Call out for Plant & Book Donations! 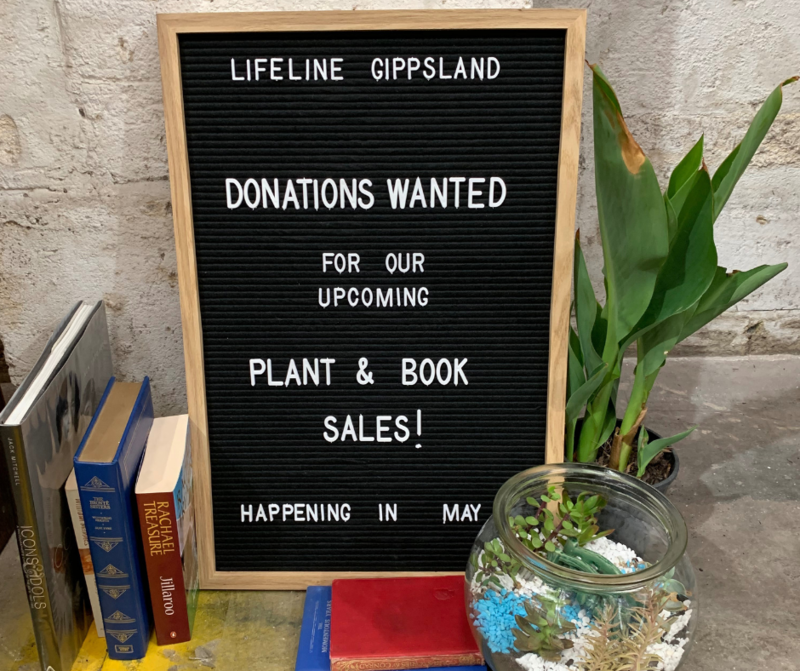 Our amazing Plant and Book Sales are happening again in 2019 and we are asking the Gippsland Community for their generous donations. Lifeline Gippsland CEO Michelle Possingham said “The month of May will be upon us before we know it so it’s a timely call-to-action to all of the plant propagators out there to don those gardening gloves and book lovers to check their shelves for a most worthy cause. Once again we are seeking support from our wonderful community throughout Gippsland to assist us to make our Plant and Book Sales a huge success”. For our Plant Sale we are seeking plants of all varieties – roses, orchids, shrubs, grasses, bulbs, pots, gardening tools, furniture, ornaments – anything really of a gardening nature – would be put to very good use! As for the Book Sale; we’re looking for all categories of books such as History, Crime, Cooking, Children’s, Travel, Art, Music, Sport, Fiction and Non Fiction, Romance, Business, Gardening, Technical, Geography, Religion, Education and Poetry. “We only receive 12% state government funding so both events are a vital fund-raising activity to help us raise much-needed funds to support our 24-hour Telephone Crisis Support Service 13 11 14, and to assist with running other important programs that help our Gippsland community each year”, concluded Ms Possingham. People wishing to donate items for the either sale can do so by dropping them into any of our Lifeline Gippsland shops at Churchill, Lakes Entrance, Moe, Morwell, Sale, Traralgon and Wonthaggi at least one fortnight prior to each event. Each event is held over two days with our Plant Sale will be held Thursday 9th-Friday 10th May followed by the Book Sale on Thursday 23rd-Friday 24th May.